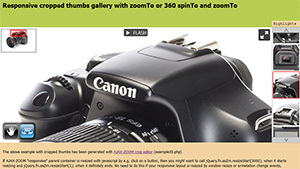 Crop large images or make thumbnails with AJAX-ZOOM and "jCrop". Generate zoomTo gallery with preview thumbs for 2D/ 360°/ 3D. With this tool you can easily create several crops from 2D images / galleries, 360 spins or 3D multirow which are loaded into AJAX-ZOOM player. Besides other thinkable purposes the goal here is to make a "crop gallery" placed outside of the AJAX-ZOOM player. Clicking on the cropped thumb will zoom and for 360/3D spin & zoom to specified area of the image. This is a really nice looking effect where the user is guided to the highlights of the product by simply clicking on the thumbs in familiar manner. Press on the buttons below to load a different content into the player. 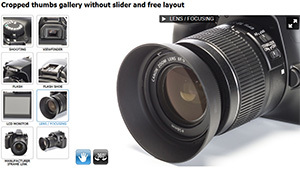 Optionally hit crop settings button or Crop settingstab to adjust crop selector e.g. set aspect ratio and output parameters for the thumbnail. Hit the crop button to toggle crop and select region to crop. When ready hit the red "fire crop" button. At the Cropped images tab you can view the crops in real size, delete and reorder the crops. Optionally add thumb title, title and description to the crop regions in Descriptions tab. Save the created setup e.g. in a JSON file to reproduce the work at some other frontend. 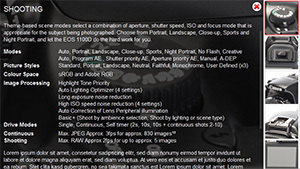 This file (example35.php) is the actual crop editor to define the copped thumbs and optionally descriptions. It is supposed to be in some restricted area of your page. For showing the results and integration of the player into your frontend please use one of the following "clean" examples as the starting point. Also please be aware of that AJAX-ZOOM is highly configurable so you can change the look and feel of nearly everything you could think of. example35_clean.php basically has the same setup as this editor but without the toolbar under the player. Of course the cropped thumbnails do not need to be loaded into the thumb slider. In example35_gallery.php they are appended to some div. 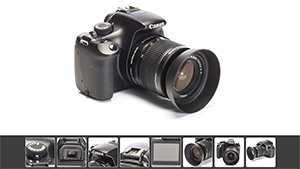 example32_responsive.php optionally loads the results of this crop editor into mouseover zoom / 360 combination and instantly attaches the crop gallery to the player. Very convenient for e-commerce. 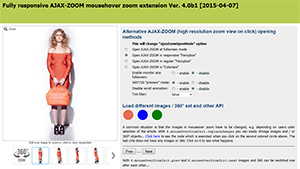 On request AJAX-ZOOM team will deliver to you exactly what you need as a different example or integrated into your page layout / html. The only difference between basic AJAX-ZOOM implementation / example is that the JSON data produced by this editor is loaded in AJAX-ZOOM onLoad callback with jQuery.axZmImageCropLoad, see below at line 044; Also in all derivative examples except example35_gallery.php we use jQuery.axZmThumbSlider to display the thumbsnails; all codes for implementing can be also found in the example35_*.php files. // Define the path to the axZm folder, adjust the path if needed! // You can also pass the path over query string, e.g. Drag & drop to reorder the thumbs, click to get the paths and other information (see below), double click to zoom. - crops will be not deleted physically here! Besides HTML or your text you could also load external content in iframe! The prefix for the source is "iframe:"
To load some dynamic content over AJAX use "ajax:" as prefix, e.g. If you do not define the title, then the content will be loaded instantly as soon as the spin animation finishes. Keep formated: - keep linebreaks, tab stops etc. You do not need to edit html of this file in order to load a different 2D / 360 or 3D content into the editor. Just enter a path into one of the fields below and press "LOAD" button. Press "GET" button to see what is currently loaded. For 2D (single image or gallery with more images) please enter local path(s) to the image(s), e.g. or image set with image paths separated with vertical dash e.g. If you want to load all images from a folder please just enter the path to this folder e.g. For 360 (single row 360 object) please enter only the path to the folder where your 360 images are located e.g. For 3D (multi row turnable object) please enter the path to the folder where subfolders with each row of 3D are located. Hotspot file path is the path to the file with hotspot configurations and positions, e.g. Crop file path is the path to the file with crop data which can be created with this editor, e.g.